Thank you so much for everything you have done in my behalf. The classes you offer are amazing and very beneficial! I thank you for the food and clothing I have received through your foundation. The books and handouts are amazing as well! I have learned so much and feel I am further ahead through the education I have received from this wonderful organization. I am definitely more confident. 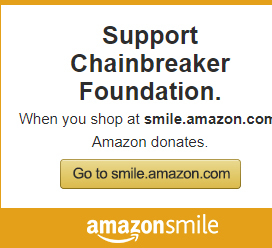 I am so thankful that the Chainbreaker Foundation exists and I am so thankful for everyone of you for educating me! I am so thankful that I can be the Chainbreaker in my family! I want you all to know how deeply grateful I am for each and everyone of you! Thank you—Thank you—Thank you!!! Because of Chainbreakers my life is brighter and I feel like there is hope. I am getting “myself” back. The journey hasn’t been easy but it has been worth it. Thank you. This is an amazing foundation that brings knowledge and comfort to those desiring to help themselves and future generations. The legacy of love will roll on and pay it forward into eternity. Thank you. Thank you for providing an organization that helps women when they know that the way they have been living is no longer an option. I know you have seen so many blossom into beautiful, healthy, healed women. You change the world one meeting at a time. Thank you for all you do to bless the lives, especially the hearts and minds, of so many broken souls. The classes I’ve been able to attend have given me clarity of mind and tools that have helped me in areas where I was totally dysfunctional. Thank you for the amazing Christmas party and all the friends I have made. Thank you, Thank you. Thank you for allowing me to be a member of Chainbreakers. My life is better because of your influence, love and kindness. I’m grateful for what is taught each week and how it can be implemented into my life. Thank you. I really want to thank you for all that you do. You have changed my life forever and I am so so grateful!!! Thank you so much.